Defined as the clearance of the state s, which is computed using the StateValidityChecker in this objective's SpaceInformation. Since we wish to maximize clearance, and costs are equivalent to path clearance, we return the greater of the two cost values. Returns +infinity, since any cost combined with +infinity under this objective will always return the other cost. Returns -infinity, since no path clearance value can be considered worse than this. Returns a cost with a value of 1. Interpolates between s1 and s2 to check for state costs along the motion between the two states. Assumes all costs are worse than identity. Since we're only concerned about the "worst" state cost in the path, combining two costs just returns the worse of the two. Check if the the given cost c satisfies the specified cost objective, defined as better than the specified threshold. 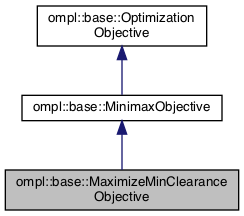 Objective for attempting to maximize the minimum clearance along a path. Definition at line 47 of file MaximizeMinClearanceObjective.h.